Earthues Natural Dyes is a short drive over a bridge from Seattle to Ballard, on a quiet street lined with trees. 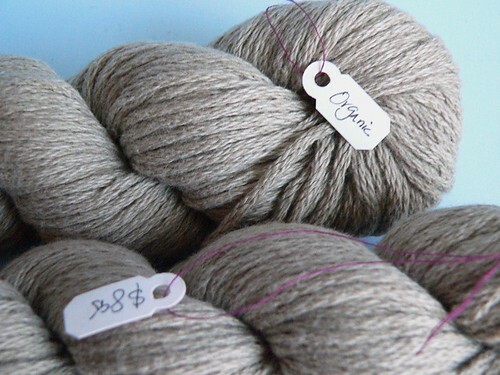 Although Earthues specializes in natural dyes and classes in natural dyes and textile arts, a small selection of naturally dyed yarns is available for sale. 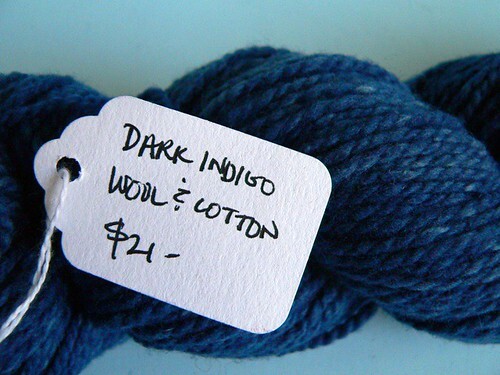 The range of colors is really lovely, from pale pastels to intense brights to dark hues with a lot of depth, like the dark indigo dyed wool/cotton blend above. The wool and cotton have taken the indigo dye at different rates, resulting in a yarn that looks like a comfortable pair of denim jeans. I'm planning to crochet a hat with this skein. 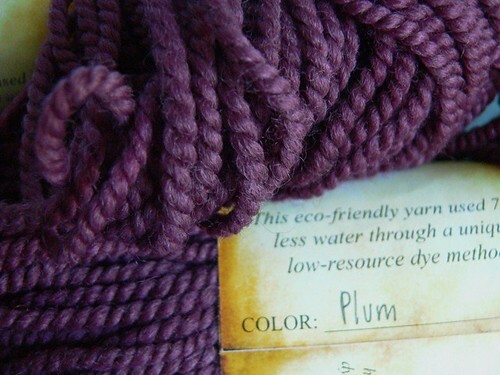 This wool yarn has a lovely sheen and a lot of bounce. There were only a few skeins of each color - in some shades, just one, which I found a little disappointing. None of them came in what I would consider to be a sweaters-worth of yarn. It's possible that they did have more in their backstock, but the people working there seemed to be quite busy and I didn't have much time to shop. What I bought is definitely enough for a scarf, though. While most of the yarns were labeled, the labels didn't always have all the information I was looking for. This one, as you can see, just says "organic" on one side and "$8.95" on the other. No yardage, no fiber content, and no color name or number. This was one of a few shades of green, all of them lovely. It has a nice soft hand and some resilience. If it turns out I have enough, I'm thinking of making a string bag with this. 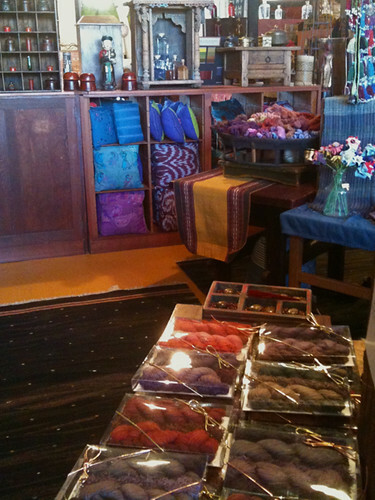 The interior of the store is charming and colorful, with lots of examples of textiles. 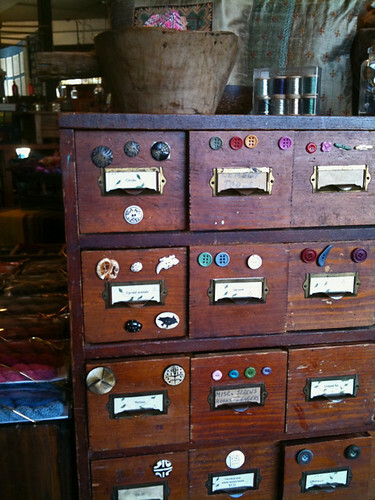 The buttons for sale come in a wide variety of shapes and materials (including bone, horn, shell, tagua nut, and wood) and many of them are dyed with the same dyes used on the textiles. I would have liked to spend more time exploring the shop and getting to talk to an employee so I could get more information about certain items (like whether or not they were for sale). 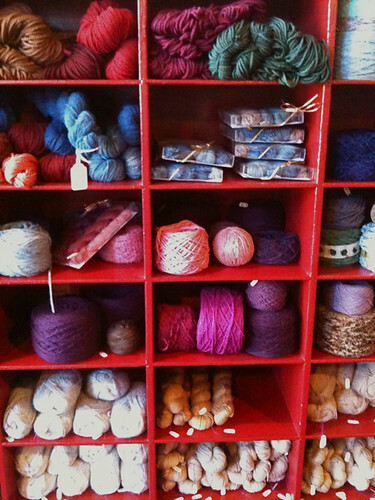 For example, there was a big bowl of tiny skeins of yarn in dozens of colors, but nothing to indicate whether it was for display only or if they were available for purchase, what dyes had been used, what the fiber contents were, etc. Hopefully I'll get to go back on another trip and be able to do more than just wonder about most of what is on the shelves.